In my frenzy of book reading over the last couple of years, I have not ventured much into the world of middle grades stories. Sure, my daughter read a lot and we spent much time browsing titles at (sniff) Borders Books or at the library. I saw the Artemis Fowl series, but said daughter was either too young for it or, when she was the right age, she passed over it, favoring My Sister the Vampire and books about dogs. So when I was offered the opportunity to read Eoin (pronounced “Owen” – you’re welcome) Colfer’s new series, I jumped at the chance. Boy, am I glad I did. Though many ages will be happy reading his new book, it does seem like it is aimed at a slightly older audience, since the main character is a seventeen-year-old FBI “agent” and there is enough bloodshed, skulduggery and evil to satisfy said older audience. One of my very favorite elements is here: Victorian England. I love books set during this time, with its shocking contrast between the extremely rich and the dirty, stinking conditions of the poor; the righteous religious believing (conveniently) that the impoverished were low because God ruled it so; in short, everything that Dickens railed against: squalor, class separation, and the lack of dignity, civil rights and hope. While we certainly had our share of horrible tenements and slums in the US, there seems to be something worse (perhaps the age?) of those in London. Maybe I have read Oliver Twist too many times. Gleefully, I find that I am rewarded with a second of my book-reading favorites: time travel. Wrap both of my favs up with the outstanding writing, and I am a giddy girl. Check, check and…check! The Low Down: Chevron “Chevie” Savano was part of a hush-hush project in Los Angeles that involved being assigned to a school in order to get close to the children of suspected terrorists. When something went wrong and the existence of the program was put into jeopardy, Chevie is reassigned to London to redeem herself while babysitting a pod in a basement. All the agent in charge tells her is that she needs to let him know if anyone comes out of the pod. Which, incidentally, no one has for about thirty years. So, naturally, when she is on duty one day, the darn thing comes to life, destroying part of the house in the process. What does she find inside? A very small boy who looks and sounds like the Artful Dodger cradling a dead man with a knife in his chest. The boy, Riley, is a little freaked out about the dead man, to say the least, but he’s more afraid that his “master” will soon follow and finish off Riley. For this man, Albert Garrick, is pure evil that no one can hide from. Not even with over one hundred years of time between them. This is a story about time travel, yes, but also about the downside(s) to it. It’s about power, greed, love, humanity, leaving your mark and how all of those things exists across eternity and always will. Another Brick in Yonder Wall, indeed. The Bottom Line: The puzzlers in this story are skillfully laid out and answered, though not in an obvious manner. In fact, some were solved when I didn’t even realize they were mysteries in the first place. The writing surrounds you completely, every bit of it containing the perfect descriptions of the sights, smells (ugh), personalities, feelings and realities of the characters and locales. The depiction of the travel itself inventive and fresh. And the secondary characters are vividly drawn and well-developed. Not only can I not wait for the second installment of the series, but I am putting Artemis Fowl on my TBR list. 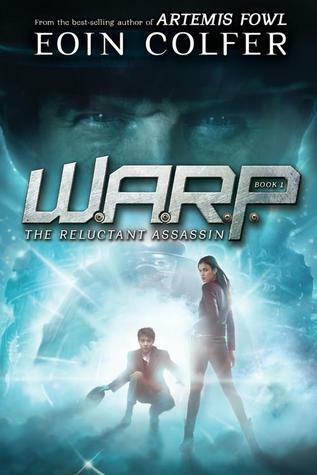 The Reluctant Assassin (W.A.R.P. #1) by Eoin Colfer was published May 7, 2013 by Disney- Hyperion. A free copy of this book was given to Ink and Page in return for an honest review. Big thanks to NetGalley/the Publisher/the Author.